Georgia inmate Troy Davis was executed Wednesday night for the 1989 murder of Mark MacPhail, an off-duty Savannah police officer. Davis died at 11:08 p.m. ET, according to a prison official. The execution was about four hours later than initially scheduled, because prison officials waited for a U.S. Supreme Court ruling on Davis' request for a stay. After 10 p.m. ET, the Supreme Court, in a brief order, rejected Davis' request. His supporters had sought to prevent the execution, saying seven of the nine witnesses against him have recanted or contradicted their testimony. Below are the developments as they happened. Read the full story here. After the warden read the execution order and asked whether Davis had anything to say, Davis - strapped to a gurney - lifted his head up and looked at the witness area's first row, which was where MacPhail's relatives and friends sat. “(Davis) made a statement in which he said ... 'Despite the situation you're in, (I) was not the one who did it.' He said he was not personally responsible for what happened that night, that he did not have a gun. He said to the family that he was sorry for their loss, but also said that he did not take their son, father, brother. "He said to them to dig deeper into this case, to find out the truth. He asked his family and friends to keep praying, to keep working, to keep the faith. And then he said to the prison staff, the ones he said 'are going to take my life,' ... ‘May God have mercy on your souls,’ and his last words to them (were), 'May God bless your souls.'" Another witness, reporter Rhonda Cook of the Atlanta Journal-Constitution newspaper, also gave quotes from Davis. According to her, Davis said: "The incident that night was not my fault. I did not have gun." "And that’s when he told his friends to continue the fight and 'look deeper into this case so you can really find the truth,'" Cook said. Davis also said, according to Cook: "For those about to take my life, may God have mercy on your souls, may God bless your souls." Davis said to the MacPhail family, according to Cook: "I did not personally kill your son, father and brother. I am innocent." Hours earlier, Davis declined what the prison offered him as a final meal, Cook said. [Updated at 11:12 p.m.] Davis has been executed, a prison representative has said. The time of death was 11:08 p.m. ET. [Updated at 10:55 p.m.] Davis' execution is expected to begin between 11:05 to 11:10 p.m. ET, the Georgia Department of Corrections says. [Updated at 10:36 p.m.] People who'd been protesting for hours across the street from the prison where Davis will be executed are chanting, "We are Troy Davis," CNN's David Mattingly reported. [Updated at 10:21 p.m.] The U.S. Supreme Court has denied Davis' motion for a stay of execution. Word of the Supreme Court's decision comes more than three hours after Davis was scheduled to be executed, and more than four hours after Davis' attorneys had filed the motion. With the ruling, Georgia is expected to proceed with Davis' execution. [Updated at 10:07 p.m.] The daylong gathering across the street from the prison by Davis' supporters has turned into a candlelight vigil, CNN's Gustavo Valdes reports. Hundreds still are waiting for a resolution. Some are praying, and some others are singing. [Updated at 9:41 p.m.] The Rev. Raphael Warnock said he was standing with Davis' relatives on the grounds of the prison when they heard the execution wouldn't happen at the scheduled time. "I was standing with the family at about 7 p.m. By that time, of course, naturally, we were expecting the worst," Warnock, a pastor to Davis' family, told CNN's Piers Morgan. "Suddenly we began to hear cheers from the crowd across the way, and the word came that the execution had been delayed. "Certainly we're glad that Troy Davis is still alive, but we are still witnessing, in my estimation, a civil right violation and a human rights violation in the worst way unfold before our very eyes. This is Troy Davis’ fourth execution date. I’m glad that he’s alive, but that in and of itself is cruel and unusual punishment. America can do much better than this." Asked if Davis had had what would have been offered as a last meal, Warnock indicated that Davis might have skipped it. “I do know that on the last time he received an execution warrant, he refused his last meal," Warnock said. "I spoke earlier tonight with his nephew ... and he said his uncle would refuse his last meal again today. He has continued to insist that this is not his last meal. I must say to you that he evinces a faith that is just amazing, even to me as his pastor." [Updated at 9:05 p.m.] The number of police officers standing outside the Georgia prison housing Davis has risen to more than 100, CNN's David Mattingly reported. The officers are watching protesters, who've been across the street for hours. The crowd has been orderly, Mattingly said. While it had been chanting for much of the day, they're "probably as quiet as I’ve heard them all night," Mattingly reported. [Updated at 8:55 p.m.] Dozens of people have gathered outside the U.S. Supreme Court in Washington, D.C., in support of Davis, footage from CNN affiliate WJLA shows. Still no ruling from the court on Davis' request for a stay of execution. [Updated at 8:39 p.m.] This video report from CNN's David Mattingly, made about 40 minutes ago, shows the people who've been protesting across the street from the prison where Davis is being held, and the police officers in riot gear who are in front of the prison, watching the protesters. [Updated at 8:19 p.m.] The mother of the police officer that Davis was convicted of killing told CNN's Anderson Cooper that she is "absolutely devastated" that the execution has yet to happen. “I’m absolutely devastated because I want it over with. ... They’ve been through the courts four times there in Georgia. They’ve been to the Supreme Court three times," Anneliese MacPhail said in an interview from her home, referring to previous delays. "This delay, again, is very upsetting and I think very unfair to us." [Updated at 8:10 p.m.] The time that the U.S. Supreme Court is taking to rule on Davis' motion for a stay of execution is unusual, CNN senior legal analyst Jeffrey Toobin said. "Usually, it’s handled pretty promptly," Toobin said. Davis' lawyers filed the motion at about 6 p.m., an hour before Davis' scheduled execution. The state attorney general's office filed a response shortly afterward. [Updated at 7:43 p.m.] After a brief moment of jubilation upon hearing that the execution hasn't yet happened, Davis' supporters - who have gathered outside the grounds of the prison where he is being held - are regrouping and talking about what might be next, CNN's Emma Lacey-Bordeaux reports. "Troy Davis can never die" is a common theme. The state of Georgia isn't proceeding with the execution until the U.S. Supreme Court rules on Davis' request for a stay. Davis' attorneys filed the request about an hour before Davis' scheduled 7 p.m. execution. Davis' supporters, who had been chanting, are now letting out cheers as drivers pass and honk their horns. Otherwise, the mood is tense as they wait for a development, Lacey-Bordeaux reports. [Updated at 7:26 p.m.] The state of Georgia hasn't yet proceeded with the execution of Troy Davis, because it is waiting for the U.S. Supreme Court to rule on his request for a stay, CNN's Bill Mears reports. Davis had been scheduled to be executed at 7 p.m. ET. His attorneys filed a motion asking the Supreme Court for a stay about an hour before the scheduled execution time. [Updated at 7:06 p.m.] Inside the grounds of the prison where Davis is scheduled to be executed, about 100 people, including Davis' sister, have formed a tight circle and are praying and singing, CNN's Gustavo Valdes reports. [Updated at 6:32 p.m.] Davis' attorneys have filed a motion with the U.S. Supreme Court, asking for a stay of execution, the court has said. No decision yet. [Updated at 6:20 p.m.] CNN's David Mattingly notes that according to the state Department of Corrections' schedule, Davis would have been offered a mild sedative, to calm his nerves, at 6 p.m.
[Updated at 5:58 p.m.] Davis' supporters outside the Jackson, Georgia, prison where he is to be executed are growing louder, CNN's David Mattingly reports. Frequent chants include: "Death Row? Hell No!" and "Free Troy Davis." [Updated at 5:54 p.m.] CNN's David Mattingly notes that Davis, who had been scheduled for execution three previous times, "has never been as close to dying as he is at this hour." A previous scheduled execution was called off more than two hours before it was to happen; this time, Davis is a little more than an hour from the scheduled time. "He has already said goodbye to friends and family visiting today," Mattingly writes. "He's been served his last meal. Everyone is waiting to see if a last-minute appeal now working it's way up the legal system might somehow stop or delay Troy Davis' pending appointment with lethal injection." 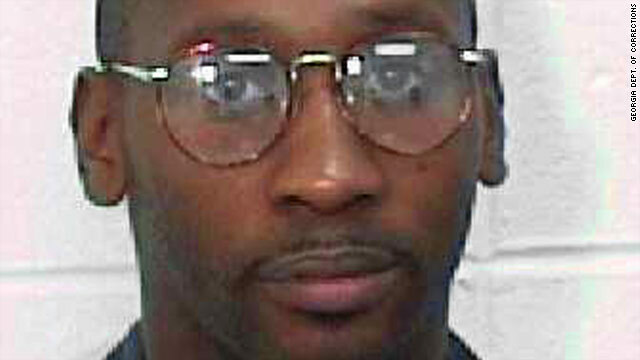 [Updated at 5:41 p.m.] The Georgia Supreme Court says it has unanimously denied a stay of execution for Troy Davis. The court also denied his request for another appeal to be heard. His attorneys will now ask the U.S. Supreme Court to halt the execution - Davis' last hope, CNN senior legal analyst Jeffrey Toobin said. "The United States Supreme Court has a procedure in place. They know when executions are coming; they are expecting an application, so I expect this will be acted on fairly quickly. ... It’s unlikely that a stay will be granted, but that possibility exists, and that’s Troy Davis’ only hope," Toobin said. [Updated at 4:33 p.m.] With one eye on the clock, celebrity supporters of Troy Davis are using their platforms to continue to spread the word about the Georgia inmate. [Updated at 4:31 p.m.] A Butts County Superior Court judge has declined to halt the execution of Georgia death row inmate Troy Davis, scheduled for 7 p.m. Wednesday. Davis’ attorney Brian Kammer tells CNN the appeal is now being brought before the Georgia Supreme Court. [Updated at 4:14 p.m.] Davis saw 25 visitors Wednesday during the six-hour window (9 a.m. to 3 p.m.) he was allowed to receive them before his scheduled 7 p.m. execution, according to the Georgia Department of Corrections. 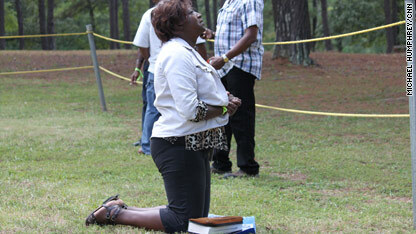 The visitors included relatives, friends, clergy and an attorney. 9 a.m. to 3 p.m.: Visitation with family, friends, clergy and/or attorneys. 3 p.m.: Will undergo a physical. 4 p.m.: Last meal offered. 5 p.m.: Opportunity to record final statement. 6 p.m.: An optional sedative will be offered. 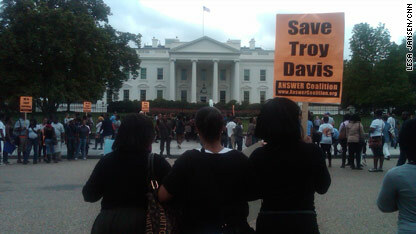 [Updated at 3:02 p.m.] About 100 people have gathered outside the White House in Washington, D.C., protesting Davis' scheduled execution in Georgia. The crowd consists mostly of students from Washington's Howard University, CNN's Lesa Jansen and Bob Kovach report. One of the protesters, Howard graduate student Tamatha Scott, said in a CNN iReport video that the students marched from Howard to the White House, responding to student leaders' call to protest on Twitter. “I started seeing the tweets about it late last night. It has been a very peaceful protest,” Scott said. "The State should not be executing Troy Davis. . . if there is even a chance that he is innocent, why execute?" Davis has gained international support. Public figures including Pope Benedict XVI, Desmond Tutu and former U.S. President Jimmy Carter, entertainers such as Susan Sarandon, Harry Belafonte and the Indigo Girls, and others have joined with Amnesty International, the NAACP and other groups in supporting Davis' efforts to be exonerated. On Wednesday, the French Foreign Ministry issued a statement saying it "deeply regrets" the parole board's decision. [Updated at 2:32 p.m.] Outside the Jackson, Georgia, prison where Davis is to be executed at 7 p.m., many of the speakers have struck hopeful notes, and some say they hope to change the system for the future, CNN's Emma Lacey-Bordeaux reports. Many are holding hand-lettered signs, with messages such as, "Spare Troy Davis." 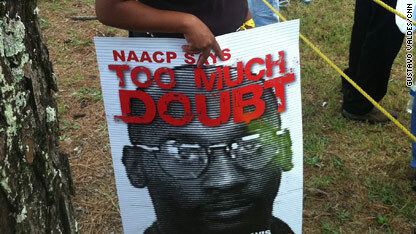 Some have produced signs showing Davis' picture and the message, "NAACP says too much doubt." One of the signs carried outside the Jackson prison refers to the NAACP's stance. [Updated at 1:34 p.m.] Dozens of people have already gathered at the prison in Jackson, Georgia, where Troy Davis is scheduled to be executed by lethal injection Wednesday at 7 p.m. ET, CNN's Gustavo Valdes reported. 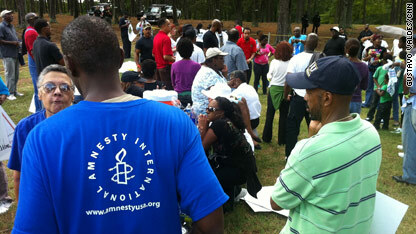 People gather Wednesday outside the prison in Jackson, Georgia, where Troy Davis is scheduled to be executed. The Rev. Al Sharpton is among those at the site. The group is praying and holding hands, Valdes reported. [Updated at 1:28 a.m. ET] The Georgia Department of Corrections told CNN it has denied a request by Troy Davis' lawyers to conduct a polygraph test. [Updated at 10:16 a.m. ET] The Georgia Board of Pardons and Paroles has declined to reconsider its decision denying clemency to Troy Davis. Supporters of Davis have been hoping that some last-ditch efforts might help save him from being executed on Wednesday night. Earlier Wednesday, his team filed an appeal asking to stay his execution. [Posted at 9:13 a.m. ET] Attorneys for Troy Davis, facing execution in Georgia at 7 p.m. Wednesday, have filed a request to stay his execution in Butts County Superior Court. Davis is scheduled to die by lethal injection Wednesday night in Jackson, Georgia, for the 1989 shooting death of off-duty police officer Mark MacPhail. The parole board declined to grant Davis clemency Tuesday following a hearing Monday in which it heard testimony calling into question physical evidence and witness statements that a Chatham County jury relied on in convicting Davis in 1991. In Georgia, only the board - not the governor - has the right to grant clemency. Since Davis' conviction, seven of the nine witnesses against him have recanted or contradicted their testimony. Davis' supporters say the original witnesses were fearful of police and spoke under duress. Other witnesses also have since come forward with accounts that call Davis' conviction into question, according to his supporters. Magnificent items from you, man. I've take note your stuff previous to and you're just extremely fantastic. I really like what you've obtained here, certainly like what you are stating and the way through which you say it. You are making it entertaining and you continue to take care of to keep it sensible. I cant wait to learn far more from you. That is really a wonderful site.